A Little Bit about R.C.I.A. 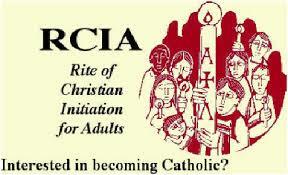 The process by which adults come into the Church is known as RCIA. 1. Unbaptized adults. The primary focus of the Rite of Christian Initiation of Adults is on those who are not yet baptized. 2. Baptized, but uncatechized. Those who have been baptized as a Roman Catholic, but did not receive further formation or instruction. Some folks may not have celebrated Confirmation nor received their first Holy Communion. 3. Those seeking full communion with the Roman Catholic Church. These are baptized, practicing Christians from other denominations who seek membership into the Catholic Church. The Rite of Christian Initiation is based on the understanding that the process of personal conversion proceeds gradually, in stages. The experience and needs of those in each category described above differ, and so the length of time may vary for each person. Contact the parish coordinator listed above for more information.